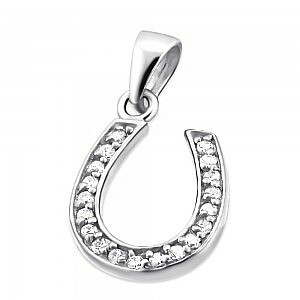 In this lucky pendant, 19 shimmering Cubic Zirconia have been set in 925 Sterling Silver in a dazzling Horseshoe shape. Why is it lucky? It’s all down to one-time Archbishop of Canterbury, St Dunstan, who allegedly nailed a horseshoe to the Devil's hoof when he was asked to re-shoe the Devil's horse. This caused the Devil great pain and when he begged for mercy, Dunstan would only remove the horseshoe and release the Devil after he promised never to enter a place where a horseshoe is over the door. We can’t possibly comment on the legend, but we can tell you that this 12 x 13mm masterpiece is a particularly stunning pendant!